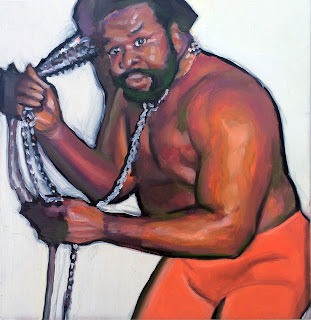 This is a painting of the wrestler Junkyard Dog, from a rather humorous publicity photo. I am not nor ever was a fan of professional wrestling but after studying this reference photo and reading about Sylvester Ritter, the man that is the Junkyard Dog, I feel like I'm finally starting to "get it". Wrestling and wrestling culture has an over the top sense of camp and drama to it that I never understood, I would complain that it wasn't "real", and everything was scripted, but I now realize that it was real enough for what they were trying to accomplish and that it was this living theater that allowed everyday people with no real acting skills to invent characters and different personas for themselves, and try it out in front of a group of rabid and willing audience members. As a creative type that maybe has finally learned to lighten up, I can see the humor in this finally. I mean, I always knew it was funny, but I think that the seriousness of the fans unnerved me. It was the FANS of wrestling that created this confusion within me. As usual, I'm blaming others for my own stupidity. Slyvester Ritter played some college football and also earned a degree in Political Science. I believe this character he created was subversive in nature. A powerful black man in chains, has definite political implications. I think that at the same time as he was making a serious historical statement on the role of black men in our society, he was having a lot of fun, and carved out an unusual way to a make some decent money and impact on our culture. Something I can definitely relate to and aspire towards. In the early 1980s Ritter moved to Mid-South Wrestling, where booker "Cowboy" Bill Watts gave him the name and gimmick Junkyard Dog, as he would wear a long chain attached to a dog collar, and white boots. He originally came to the ring pushing a cart filled with junk called the "junk wagon" and lost most of his early matches before his character caught on and became the top face in the company. While on top he feuded with some of the top heels in the company, including a now infamous angle with the Fabulous Freebirds where they blinded him with hair cream. At the peak of the feud JYD's wife gave birth to their first child, which was made part of the storyline. It was explained that JYD could not see his new daughter, something that increased the heat on the Freebirds to the point where they needed police escorts in and out of arenas. The feud ended with the still-blinded JYD and Freebird leader Michael "P.S." Hayes wrestling in a dog collar match. Other notable feuds involved Ernie Ladd, Ted DiBiase, Kamala, King Kong Bundy, and "The Natural" Butch Reed. The feud with DiBiase was particularly notable as DiBiase, once JYD's friend and tag-team partner, turned heel and subsequently won a loser-leaves-town match against JYD with the help of the loaded glove, which was a DiBiase calling card, forcing JYD to leave town for an extended period of time. A masked man physically resembling JYD, known as Stagger Lee, subsequently appeared in the region and began to defeat the competition, one by one, including DiBiase. Though DiBiase and the other heels strongly suspected that Stagger Lee was in fact JYD, they were unable to unmask him to prove their suspicions. Stagger Lee disappeared once the loser-leave-town clause in the JYD-DiBiase match had expired, and JYD returned and reclaimed the North American Heavyweight Championship. Ritter died on June 2, 1998, in a single-car accident on Interstate 20 near Forest, Mississippi, as he was returning home from his daughter LaToya's high school graduation in Wadesboro, North Carolina.The apparent cause was falling asleep at the wheel. Ritter's body was laid in an unmarked grave at Westview Memorial Park in Wadesboro, North Carolina, however a marker was placed at his grave by November 2012.